Short black neoprene skirt bell shaped with gores. Chloé is wearing a size 36 (chest 85cm, waist 60cm, hips 92cm, height 1m76). Short black neoprene skirt with gores. The skirt is composed of two panels; the bell-shaped bottom panel is placed on top of the top panel with the sharp edge visible. The waist is marked by a belt of 6 cm high. Pockets are inserted into the seams. The skirt closes with an invisible zip in the middle back and a small hook, and ends with a free edge (the advantage of this material is that you can adjust the length of the skirt easily, with a sharp pair of scissors). Main fabric: 100% Neoprene. Fully lined skirt: 100% viscose. Dry cleaning. Made in Europe. The Isaure skirt can be worn with the top Paulette panther or Paulette glitter, in their two versions (buttons in front or in the back). The set will enhance the small girls and the silhouettes in A (the hips will be hidden by the volume of the skirt) and the V (shoulders marked will be rebalanced by the volume of the skirt). For a total black look, but more relaxed, the Isaure skirt will also go perfectly with the black Laurette top. This set will flatter the X and I silhouettes (which can give shape to their long silhouette by marking their waist). 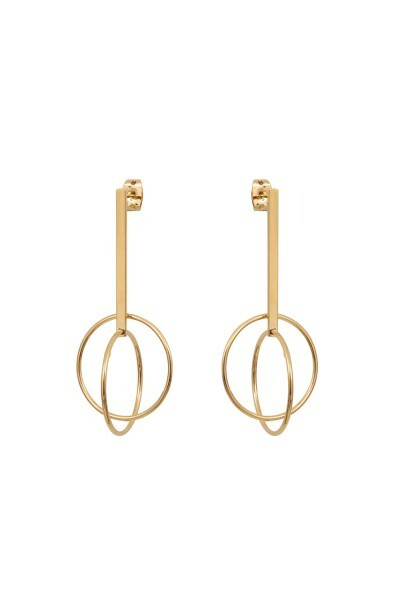 Gold plated earrings with 24ct gold. Total height 5cm. Slinky silk top, with thin strap. The top is V-neck at the front and back. The Laurette top is versatile: you have the choice between wearing the six small round silver buttons in front of, or in the back.